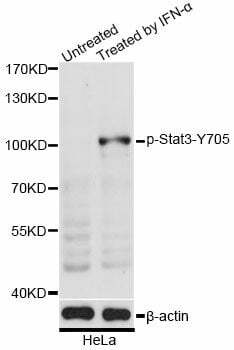 Small volumes of anti-Stat3 antibody vial(s) may occasionally become entrapped in the seal of the product vial during shipment and storage. If necessary, briefly centrifuge the vial on a tabletop centrifuge to dislodge any liquid in the container`s cap. Certain products may require to ship with dry ice and additional dry ice fee may apply. The Stat3 transcription factor is an important signaling molecule for many cytokines and growth factor receptors (1) and is required for murine fetal development (2). Stat3 is constitutively activated in a number of human tumors (3,4) and possesses oncogenic potential (5) and anti-apoptotic activities (3). Stat3 is activated by phosphorylation at Tyr705, which induces dimerization, nuclear translocation, and DNA binding (6,7). Transcriptional activation seems to be regulated by phosphorylation at Ser727 through the MAPK or mTOR pathways (8,9). Stat3 isoform expression appears to reflect biological function as the relative expression levels of Stat3alpha (86 kDa) and Stat3beta (79 kDa) depend on cell type, ligand exposure, or cell maturation stage (10). It is notable that Stat3beta lacks the serine phosphorylation site within the carboxy-terminal transcriptional activation domain (8). Western blot analysis of extracts of HeLa cells, using Phospho-Stat3-Y705 antibody at 1:2000 dilution. HeLa cells were treated by IFN-Î± (100ng/ml) for 30 minutes after serum-starvation overnight. 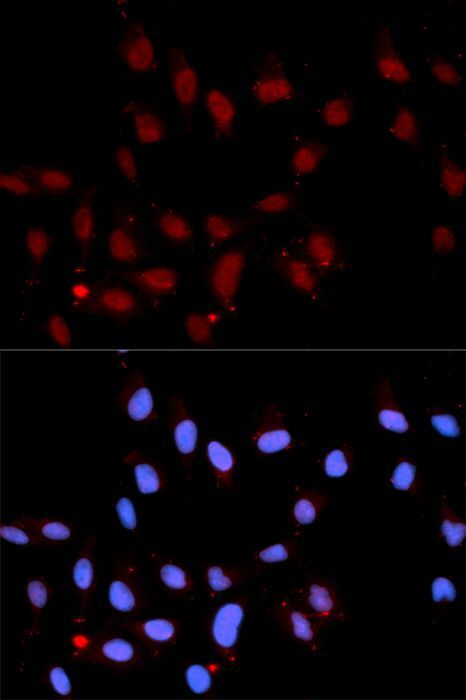 Immunofluorescence analysis of U2OS cells using Phospho-Stat3-Y705 antibody. Blue: DAPI for nuclear staining. NCBI/Uniprot data below describe general gene information for Stat3. It may not necessarily be applicable to this product. STAT3: transcription factor of the STAT family. Phosphorylated and activated by receptor-associated kinases downstream of many cytokines and growth-factor receptors. Constitutively active in a number of human tumors. Forms homo- or heterodimers that translocate into the nucleus where they regulate transcription. Two alternatively spliced isoforms have been described. 1. Compared to wild-type STAT3, the STAT3 R414K/R417K mutant shows attenuated tyrosine phosphorylation and it is a less active transcription factor.